According to figures from a Wall Street Journal report, more than 3.6 million Americans born in 1957 are still alive. Those older than 61 number millions more, including those who have memories of this date when federal troops escorted nine African-American students to their respective classes at Little Rock’s Central High School. Today’s anniversary marks a milestone in the modern civil rights movement of the United States. At the time, the event culminated a series of political cat-and-mouse games between Arkansas’ segregationist governor, Orval Faubus, and at times, a reluctant Eisenhower Administration. Faubus used his state’s own National Guard to prevent the integration of Central High on September 4. The move was political high theatre at a time when any Southern governor who appeared to comply with the U.S. Supreme Court’s troublesome admonition in Brown, with all deliberate speed. President Eisenhower, anxious to avoid an escalation, attempted to persuade Faubus to remove the National Guard before a federal court ordered such an outcome, compelling the president to enforce the court’s decree. Later that same month, federal judge Richard Davies ordered Faubus to allow the nine students to attend Central High School. 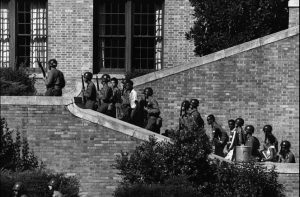 On September 23, 1957, members of the 101st Airborne Division, the storied unit that was among Eisenhower’s D-Day command, escorted the Little Rock Nine into Central High. Fears of imminent violence, however, saw the African-American students soon ushered out a side entrance after little more than an hour. It was on the 25th of September that, again, with a massive show of force by the federal troops, that Minnijean Brown, Terrance Roberts, Elizabeth Eckford, Ernest Green, Thelma Mothershed, Melba Patillo, Gloria Ray, Jefferson Thomas, and Carlotta Walls reentered Central High – and stayed. Each student was under constant protection by one or more soldiers during that subsequent school year. In the fall of 1958, Orval Faubus ordered all schools in Little Rock closed until a local referendum on school integration was held. By an almost three-to-one margin, the citizens of Little Rock voted against integration. The schools remained closed for the ’58-’59 school year. Today, more than 40 million Americans were alive when federal troops escorted the Little Rock Nine into Central High School. Of the remaining 297 odd million, few have not at least heard of the Little Rock Nine and of a time when integrated schools was the stuff of dreams for minority citizens. Through the same insidious cracks in our national consciousness that allowed the myth of the Lost Cause to thrive for a century and a half, a sizable portion of Americans believe, or claim to believe, that Little Rock in 1957 was somehow, well, great. Likewise, there exists an even more widely held belief that state and local government is somehow more just than the will expressed by society through a national government. And while that national government has routinely engaged in injustice, it has, at times, been the only force capable of correcting the mob tyranny of state and local governments.